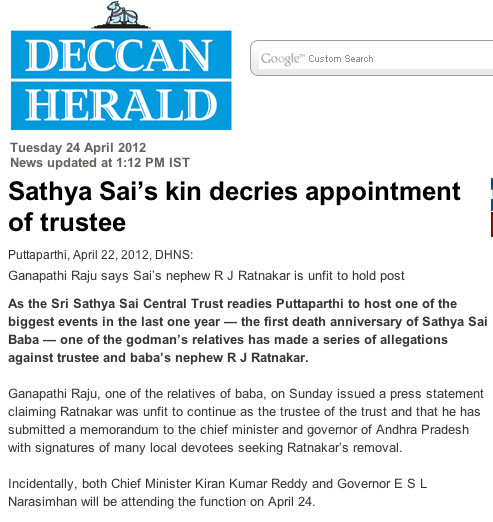 For background to this story, see my post: Violence Erupts In Sathya Sai Central Trust Saga. 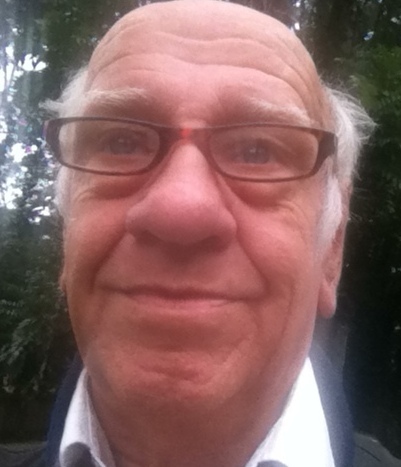 Barry Pittard on July 9, 2013. In yet another turn to the ongoing turf war between the Satya Sai family members, Ganapathy Raju and Ratnakar Raju, the police on Sunday arrested Ganapathy Raju and his son following a complaint lodged by a person said to be a close associate of Ratnakar Raju. The complainant alleged that he had been attacked by Ganapathi Raju a week ago. Following the complaint, police have arrested Ganapathi Raju, who is a close relative of Sri Satya Sai Baba, along with son in Puttaparthi on Sunday. According to Puttaparthi police circle inspector Sridhar, a person named Sai Prasad, who was said to be the follower of Satya Sai Cenral Trust member Ratnakar, lodged a complaint with the police that Ganapathi and his son had attacked him with an iron rod near the APSRTC bus stand in Puttaparthi a week ago. Acting on the complaint, the police arrested the father-son duo and later admitted them to a hospital, as both had injuries. Some of the alleged followers of Ratnakar had allegedly attacked the residence of Ganapathi, who is the first cousin of Sai Baba, in Puttaparthi on July 7. Later, he went to the police station for lodging a complaint and had gone missing since then and was arrested by the police along with his son on July 14. Differences between Ratnakar and Ganapathi reached a peak after the trust members received a mail, in which the mailer demanded a ransom of `25 lakh from them. After learning about the mail, Ganapathi suspected it as the handiwork of Ratnakar and asked the trust members to trace the persons involved in it. “I was actually surprised that Ganapathy Raju didn’t get into trouble before”. The turf war between the relatives of Sri Satya Sai Baba reached its peak with an attack on the residence of M Ganapathy Raju, the first cousin of Satya Sai Baba, by alleged followers of Ratnakar, member of Sri Satya Sai Central Trust and also nephew of Sai Baba, in Puttaparti on Sunday. 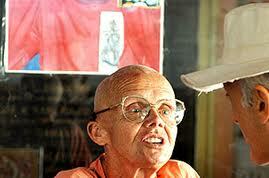 The agitators also burnt Ganapathy Raju’s effigy by alleging that he is hurting the sentiments of Satya Sai devotees. Though it was learnt that Raju went to the police station for lodging a complaint over the incident, he did not return home till late in the evening. Meanwhile, rumours were making rounds in Puttaparti about the abduction of Ganapathy Raju by followers of Ratnakar. There are also reports that the police took him into their custody and shifted him to Bangalore citing security concerns. Following the demise of Sai Baba, allegations poured up against the trust members especially against Ratnakar, that he is damaging the image of Sai Baba. However, Ratnakar described all the allegations as ‘baseless’ from time to time. Meanwhile, the trust members received a mail from rajuug 1958@yahoo.in, in which the mailer demanded a ransom of Rs 25 lakh from the trust members. After learning about the mail, Ganapathy Raju, whose mail ID (rajug1958@yahoo.co.in) is almost similar to the above mail ID suspected it as the handiwork of Ratnakar and sought the trust members to unravel the persons involved. Later, he also lodged a complaint with the district SP some time ago and it was learnt that a CID official directed the district police to probe the issue recently. As per directions, the district police enquired him about it.